Oilseed radish is a unique cover crop that farmers are planting to improve their soil quality for economic crop production. It has the ability to recycle soil nutrients, suppress weeds and pathogens, break up compaction, reduce soil erosion, and produce large amounts of biomass. Freezing temperatures of 20° to 25° will kill oilseed radish which allows for successful no-till spring planting of subsequent crops. As a fast growing, cool season cover crop, oilseed radish is best utilized when planted after small grain (e.g. wheat) or corn silage harvest. 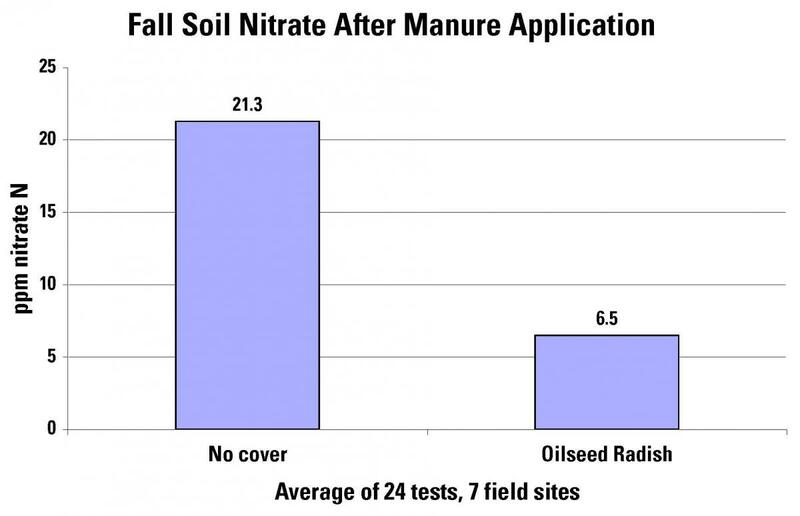 Excess nutrients in manure amended soil are rapidly absorbed by this cover crop, thus preventing leaching or runoff of nutrients into water systems. Fig. 1. Oilseed radish taproot compared to one foot ruler. Oilseed radish (Raphanus sativus [L.] var. oleiferus), belongs in the Brassicaceae plant family, commonly called mustards. The Daikon type of oilseed radish has a large, fleshy taproot that can grow 2 to 3 inches in diameter and one foot or more in length (Fig. 1), not including the fine root hairs that spread from the main taproot. Above ground growth consists of wide leaves that are soft, moist, and fast growing. The foliage reaches one to two feet in height in a semi-erect stature. Leaf stems easily break from the main root, therefore traffic or grazing will destroy plant growth (Fig. 2). Seed is planted to a depth of one-half inch. Seed size is similar to alfalfa; therefore, when using a drill, a small seeder attachment is necessary. Broadcast seeding of oilseed radish can be done successfully if followed by light tillage incorporation. Having the soil level after cover crop planting will allow for no-till planting of the following crop next spring. Fig. 2. Succulent broad leaves on oilseed radish grow rapidly by utilizing excess nutrients in soil. Seeding rates for oilseed radish will vary according to planting method and date. When drilling before August 15 in Northern Ohio, a seeding rate of 8 to 10 pounds per acre is sufficient. Between August 15 and early September when drill seeding, it is recommended to increase seeding rate to 10 to 12 pounds per acre. However, broadcast application may require an increase of 2 pounds per acre over drilling rates. Several studies have reported that lower seeding rates (6 lbs. per acre) were successful with ample soil moisture and available nutrients when planted before August 15. Weed suppression is an extra attribute of oilseed radish cover crop. Due to its ability to germinate and vigorously grow under cool conditions, oilseed radish will smother out weeds. This may eliminate a fall herbicide application. Oilseed radish has the potential to produce a total of 9.8 tons per acre of dry biomass when planted by September 1 (Chart 1). Chart 1. Fig. 3. Weed suppression may prevent fall herbicide application. 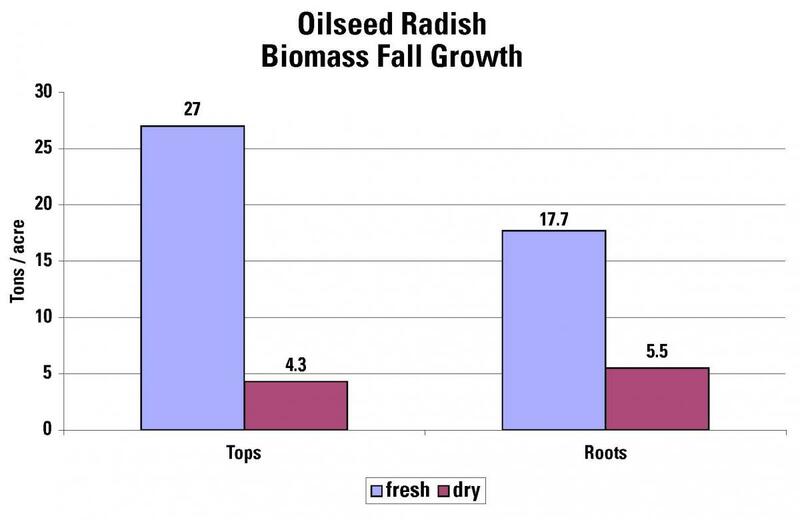 Due to its fast growing ability, oilseed radish is capable of producing large amounts of biomass in a short period of time. Capturing and recycling of excess soil nutrients in biomass is one of the most important features of this cover crop. When planted after manure, sludge, or fertilizer application, oilseed radish may prevent water quality problems by storing nutrients in its biomass. Due to its fleshy composition (and low carbon: nitrogen ratio), the plant material easily decomposes and nutrients become available for the crop planted the following spring. The absorption of soil nitrate (NO3) by oilseed radish and decrease in soil NO3 concentration after fall manure application are illustrated in the following example (Chart 2). 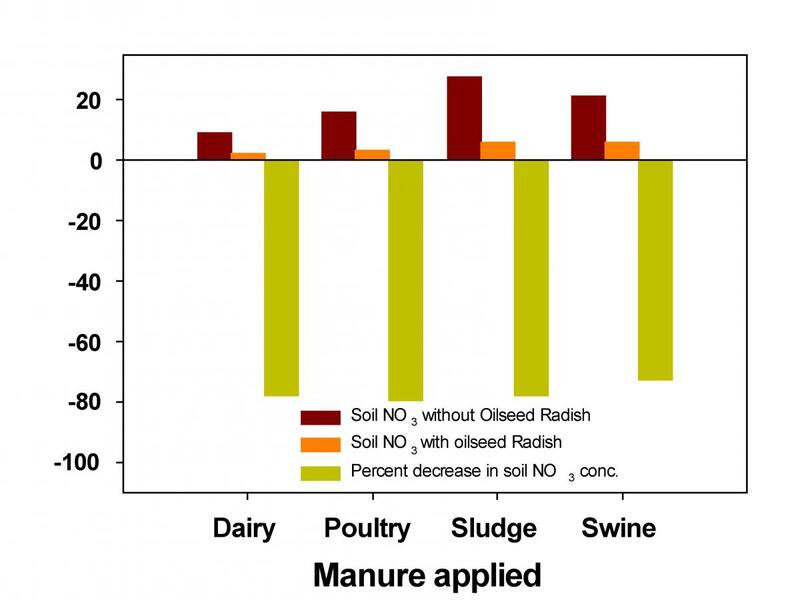 Averaged across soils and types of manure application, oilseed radish substantially uptake NO3 and greatly decreased by more than 70% NO3 concentration in manure amended soil compared with control soil. Table 1: Nutrient content of oilseed radish dry biomass. Fig. 4. Decayed oilseed radish taproots have helped break compacted soil and allow for no-till planting. The large taproot produced by oilseed radish generally helps to break-up compacted soil layers over time. These taproots break down easily over winter, leaving holes in the ground that aid in water infiltration and rooting of the subsequent crop (Fig. 4). Freezing temperatures of 20°F will kill oilseed radish. Therefore, Ohio conditions will winterkill this cover crop without any requirement of additional spring time management. One problem with decaying oilseed radish is the smell given off during decomposition. It has a sulfur-like odor that may take a few days to dissipate. If allowed to set for seeding, oilseed radish can become a weed pest. If late fall temperatures remain mild, a mowing or tillage may be necessary to prevent viable seed set. Mid-Wood Inc., Bowling Green, Ohio. Gries Seed Farms Inc., Fremont, Ohio.